Last night, I had a nice short dream with Sri Narayani Amma. I was seated on the floor making a poo-charam maalai (small flower garland) for Sri Skanda. I always chant Sri Skanda's Mantra while making this garland. 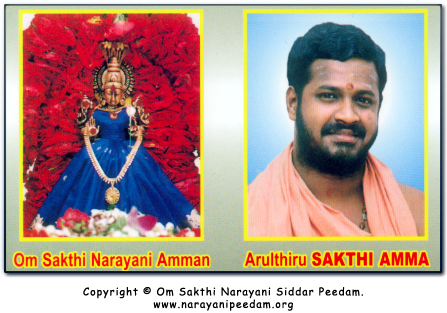 As I continued to chant, I looked at a nearby chair and on it materialized from thin air was Sri Narayani Amma. She was wearing her kavi uduppu (sannyasin robe). She looked my way and I noticed that her lips moved in sync with my lips. She repeated Sri Skanda's sacred mantra with me. Then as I continued to chant the mantra while making the poo-charam maalai, I looked back at the chair where Amma was and She had disappeared. My attention shifted back to the poo-charam maalai and my mantra chanting. Then periodically I would look back at the chair and Amma would reappear again, chanting the mantra with me. I then awoke.